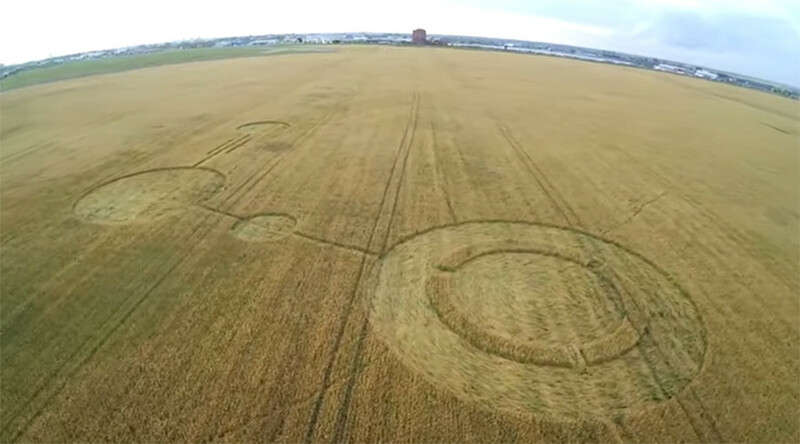 Mysterious crop circles have appeared in Russia’s Samara region, with local residents, thrilled by the shapes of “possible extraterrestrial origin,” recalling that a similar pattern surfaced on the same buckwheat farm exactly a decade ago. The circles were discovered by a local resident off the highway just outside the city of Tolyatti. The design comprises of 5 circles ranging from 60 to 150 feet in diameter connected by lines. A local paranormal research organization that is searches for extraterrestrial life has noted that the same circles appeared on exact same day 10 years ago in 2005. “We examined the photographs. We will now l analyze and compare the photos with similar phenomenon that was recorded in Tolyatti 10 years ago,” Nikita Romanov, head of the regional research association Kosmopoisk Romanov, told RIA Novosti. The drone footage of the circles was shot by Aleksey Zagorodnikov, a resident who told local news that he and his friend were testing their quadcopters and saw nothing on that field on Sunday. The circles apparently appeared Monday night, causing locals to promulgate theories about alien contact. The association of anomalous phenomenon and UFO researchers notes however that not a single stem has been broken inside the design pattern, claiming that the stems were “interestingly laid out.” According to Nikita Mikhailov from Kosmopoisk, the radiation reading at the site tested at normal levels. Not ruling out UFO involvement, Mikhailov said that it’s most likely that the circles’ sudden appearance is a “natural phenomenon.” The circles that appeared there ten years ago were made by the local farmers who played a prank creating 200 meter circles, according to RG newspaper investigation. The research crew will now focus on looking for answers about the mysterious shapes, cross-referencing similar sightings from other parts of Russia and across the world. Circles have been popping up in random parts of the world in the past two months. In late June, two elaborate new crop patterns in the English county of Wiltshire, home of the iconic Stonehenge circle. At least two patterns were spotted in June in different parts of Russia, in Adygea Republic and Krasnodar region.